Happy Thursday and we are hosting the DIY Crush Part #50 today! It’s almost a full year of DIY’S!! I had so much fun going through all the great DIY’S from last week, did you see them? If not, see last week HERE. To give you extra exposure, we pin every instructional post you are linking up to this board! Follow us on Pinterest! I would love for you to spread the word about this party!! The more the merrier! I will pin every instructional post but won’t be able to comment on every post. NEW this week is that the most clicked post from last week’s party will be featured in the new week! Drumroll please!!!! 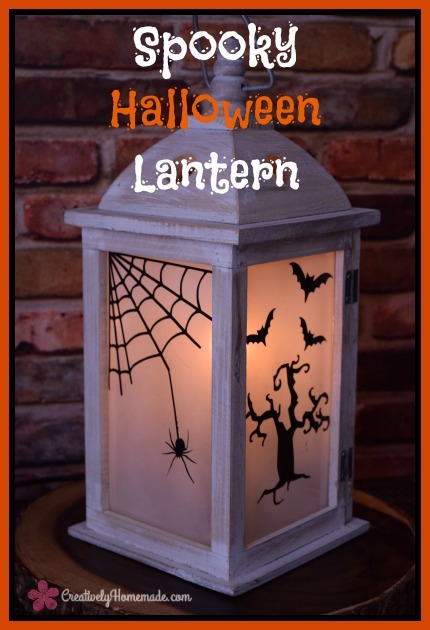 The most clicked post is this beautiful spooky Halloween lantern from Creatively Homemade. The tutorial shows you step by step how this lantern is made! So cool! This tutorial would also be great for other themed lanterns, not just for Halloween! Ready to party now?? Let’s see what you have been up to lately! Thank you for partying with me!! Have a wonderful weekend, Denise! Hi how fun!! I hope I remember this party. I’ve been looking to learn a new craft! Thank you for visiting! You can hop on the mailing list (sidebar) to get updates on what’s happening here at DIY Crush!